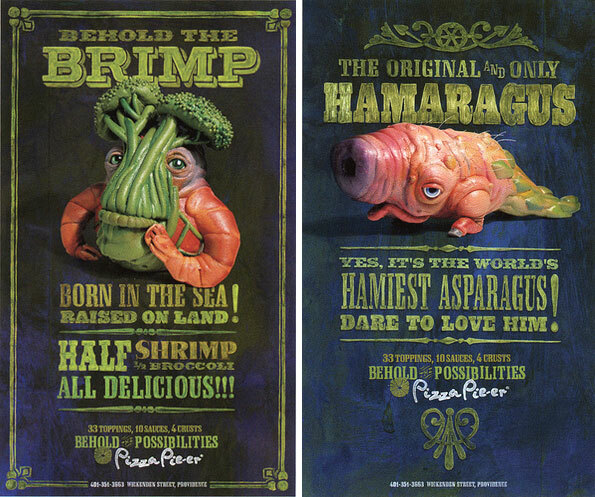 These may be the first circus-sideshow posters in history that encourage you to eat the genetic freaks. They’re ads for a pizza place called Pizza Pie-er, which has so many toppings (33), sauces (10) and crusts (4) that you can mix them into all sorts of unnatural combinations. The Brimp (“Born in the sea! Raised on land!”) looks marginally more appetizing than the Hamaragus (“Dare to love him!”). The work is by Untitled, an agency in Waltham, Mass. The campaign reminds me a bit of the garbage-beasts in Goodby’s ads for the California Coastal Cleanup Day. Via Advertising for Peanuts.